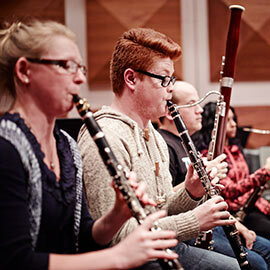 WATERLOO – Wilfrid Laurier University’s Faculty of Music, in partnership with NUMUS (New Music Now), will present two world premiere performances at its “In Celebration” concert April 2 and 3. The concert, part of the 40th anniversary celebrations of Laurier’s Faculty of Music, will be held in the Theatre Auditorium on Laurier’s Waterloo campus. "In Celebration" will feature the world premiere of a work for orchestra and choir entitled, Babel, composed by Laurier alumna, Stephanie Martin (BMus ’85). Martin’s piece is inspired by a dramatic poem written by her sister. The composer hopes to capture the poem’s despair, darkness, elation and hope. Martin, currently a music professor at York University, was commissioned by NUMUS in 2013 to compose this work with support from the Ontario Arts Council. "In Celebration" will also feature the world premiere of a piano concerto by Glenn Buhr, a Laurier composition professor and former artistic director of NUMUS. The work will feature pianist Keenan-Reimer Watts (BMus ’14). There are three movements to the composition. The first is a set of variations on a jazz song of Buhr’s entitled Same Old Sorrow. The second is called deeper still. Buhr describes it as sound art design, with piano and orchestra outlining a gradual swirling descent. The music is active and always on the move, but the effect is tranquil and contemplative. The final movement – Bemsha Passacaglia – is a comedy based loosely on the style of jazz icon Thelonious Monk, though also influenced strongly by the works of Igor Stravinsky. Buhr’s piece is dedicated to Ralph Elsaesser, professor emeritus in Laurier’s Faculty of Music, who passed away June 16, 2015 and who originally commissioned the piece. The concerts will be held Saturday, April 2 at 8 p.m. and Sunday, April 3 at 3 p.m. in the Theatre Auditorium. Tickets are $20 for adults and $5 for students. Tickets will be available at the door or can be purchased online.